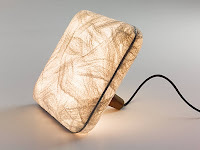 Ayala and Albi Serfaty at Aqua Creations are launching these new lamps at Superstudio Piu at Milan Design Week 12-17 April. There are loads of seventies references around at the moment but most of them are shiny-shiny disco or blue denim related. It's nice to see some designers harking back to the more subtle side of the decade - its softer styles and natural-look shades. I like that these are so retro but also really inventive. 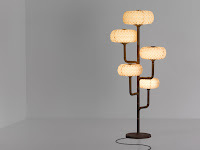 The tree-like Molecules collection is brilliant and the TokoNatsu is a all fuzzy in a late-night back-to-mine sort of way. The pair say they take inspiration from marine life. Some of their bigger pieces are more floaty and one light sculpture piece is like a shaggy iceberg but I like the seabed types like these.